Why did you decide to work with Gil Norton again? 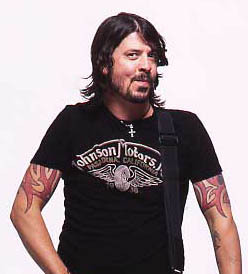 "The first Foo Fighters record was just a demo I did at home. We hired Gil for the second because of his work with the Pixies. He made us spend time in pre-production, arranging and composing. After that, we built a studio in my basement in Virginia and made the next two albums comfortably, having barbecues and recording when we felt like it. We did 'In Your Honor' the same way in California. But on the acoustic tour for that record I started writing on piano and imagining string sections, swarms of echo guitar and four-part harmonies. Rather than make 'Back In Black', I wanted to mix NoMeansNo with 'Odessey & Oracle'. We needed someone to break us out of our comfort zone, so we called Gil." Ballad Of The Beaconsfield Miners features some nifty acoustic fingerpicking. "That's Kaki King. She's an amazing guitarist. Go to YouTube and watch the video for Playing With Pink Noise. She makes Eddie Van Halen look like he was in the Germs! She's not unlike Michael Hedges; lots of hammer-on, over the neck, fretboard work. I'm a very basic guitar player,but I was really proud of this instrumental. So I showed it to her and within 1.8 seconds she was playing along like it was nothing! we've never had an instrumental, it drives home that this is an album, it's sequenced like an LP; there's a side A and side B." A bit like Led Zep III? "'Zeppelin III' was the soundtrack to me dropping out of high school! I'd put the cassette in my VW Bug, smoke a joint, drive to school and sit in the parking lot high, thinking, Do I really want to go in after listening to 'Celebration Day'? then I'd hear the school bell ring, start my car and go right back home."